Vegetables require to undergo variegated processing, especially at the large scale and to enhance the productivity, industries associated with thereof has approached conveyor system, however, failed to achieve the desired productivity due to the poor quality of conveyor belts used in. For those, the offered conveyor belts for vegetable are absolutely effective approach, helping hundreds of industries to augment their productivity at the cost effective rates. These conveyor belts for vegetables are profoundly engineered by inputting the FDA approved PVC/PU material in accordance to the set quality standards that shares excellent withstand capabilities against diverse environments. The FDA accreditation of our vegetable conveyor belt entitles its use for the all types of food products in addition to vegetables, whereas complies with international quality standards exhibits its highest safety and reliability aspect. Whether you require vegetable conveyor belt for steeple angle or perpendicular angle, we are savvy enough to design and develop the one that best meets your requirements and ensure outstanding performance all across. 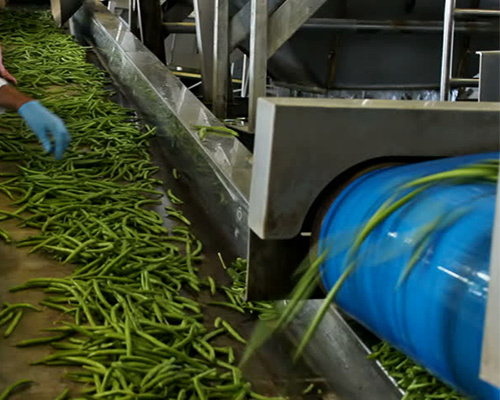 We determine the area of application and accordingly manufacture a range of the conveyor belt for vegetable by means of the hot vulcanization technology to give you the robust solution for your application need that shares highest reliability through the lifespan and is a reason for our bloom in the market at the world level. Be it washing, Sorting, Grading, Packing, Inspection, Potato handling or Transport, our vegetable conveyor belt promise to thrive for every application, thanks to the flexibility, water & the heat resilient nature of the PVC/PU material of construction.